I adore Key Lime Pie and order it as often as it appears on a dessert menu. Most of the time I’m disappointed. It is usually too sweet, not tart enough and the texture just screams gelatin. When I took a bite of this mousse it reminded me of a super light key lime pie filling. The best part is that it doesn’t actually require key limes, which have a short growing season and the bottled stuff just leaves me flat. The mousse is tangy, just a touch sweet, and it is so light, it melts on your tongue. 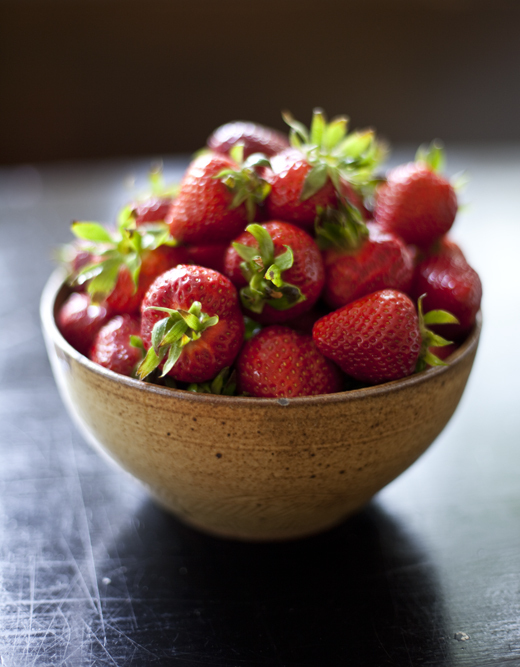 The fresh strawberries lend a perfect balance of flavor and texture to the dessert. I put them in glass jars because the lemon-yellow mousse and lipstick-red strawberries are so pretty together I wanted to be able so see them. 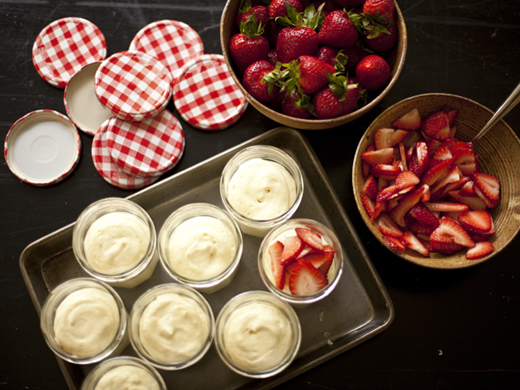 It is also the best way to bring dessert along to a pot luck or picnic. These jars are probably familiar to many of you who eat Bonne Maman French preserves that come in them. I save the jars and pretty checkered lids to reuse. You can make this mousse with just lemons, or limes, but I thought the combination of lemons and limes gave the mousse a more complex flavor, that ended up tasting like the fragrant key limes. Zest the citrus first, then juice them. 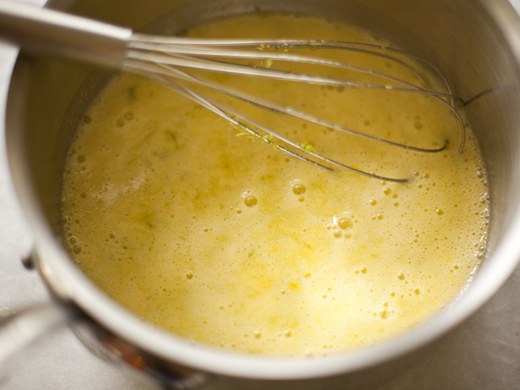 In a non-reactive saucepan whisk together 3 eggs, 3 yolks (reserve the 3 egg whites), 3/4 cup sugar, salt, juice, and zest. Cook over medium heat while stirring constantly, until it thickens, about 10 minutes. Press through a fine mesh strainer. 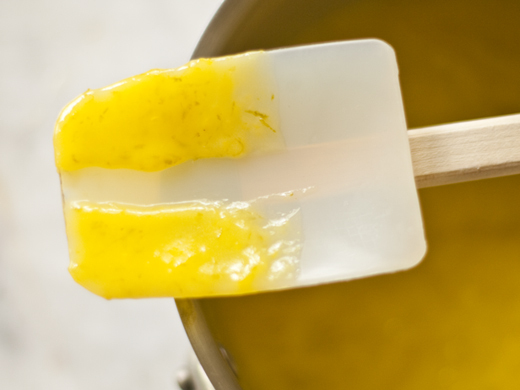 Cover with plastic wrap and refrigerate until the lemon curd is cool. Can be made a day or two ahead. 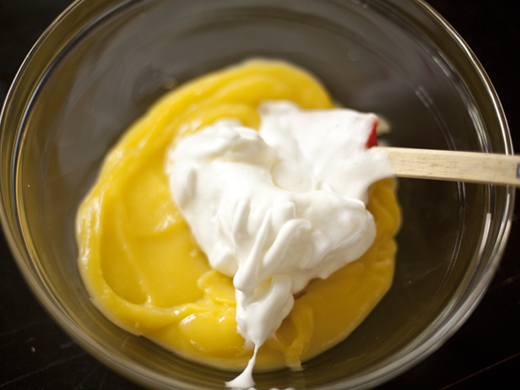 Add 1/3 of the whites to the chilled lemon curd and mix to lighted the texture of the curd. Gently fold the remaining whites in. 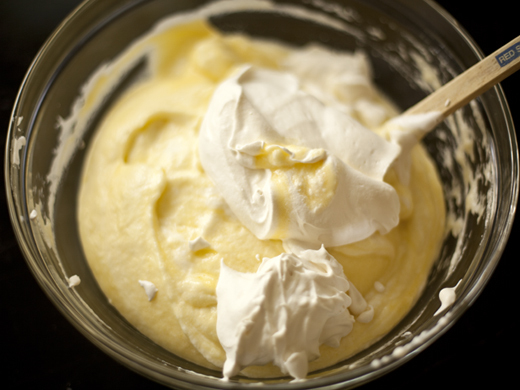 Fold the whipped cream gently into the lemon mousse. 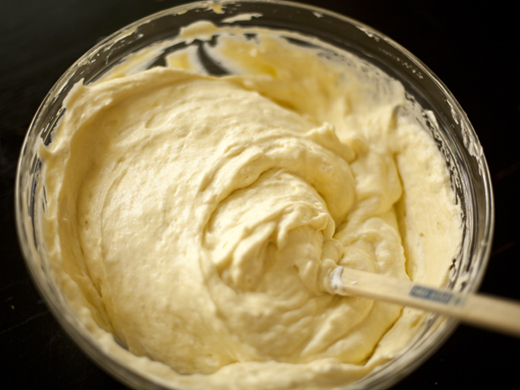 Fold just until the cream is smoothly incorporated. Start with very fresh and sweet berries. If they aren’t as sweet as you like, you can add more sugar, or less if they are very ripe. Mix the berries, sugar and liqueur in a bowl. Let the berries sit for at least 30 minutes, so they release some of their juices. Can be made several hours in advance. 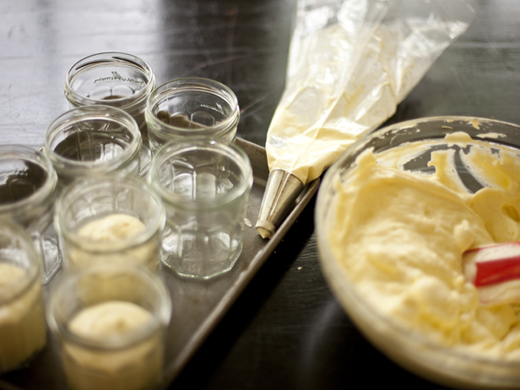 My friend, Shaina Olmanson, is an exquisitely talented and creative blogger and has just written a book about ways of making gorgeous desserts in jars. Check out Shaina’s book Desserts in Jars: 50 Sweet Treats that Shine for more ideas. Gorgeous. I share your disappointment in most key lime pies, I’ll definitely have to check this recipe out. Gorgeousness!! Love each and every photo. Just beautiful. What a beautiful mousse with those strawberries on top. I have never tried lemon mousse yet I’m sure it is totally addictive! I just wanted to clarify. the recipe calls for 6 large eggs but for the lemon curd it asks for 4 eggs and 4 eggs yokes. Just wanted to clarify if was meant to say 6 egg yokes. I will fix this right now! Takes a village to write a post! Oh my! This sounds positively delightful! Be still my heart. Lovely, lovely, lovely. Another great idea for Bonne Maman jars! I’ve been using mine to store my collection of vintage buttons by colour! I’ll have to branch out into desserts now! I love anything citrus! Fantastic–another one i can do. i love the addition of the strawberries. perfect! I love the jars u’ve used!! lime and strawberry.. both such fresh flavors for summer!! 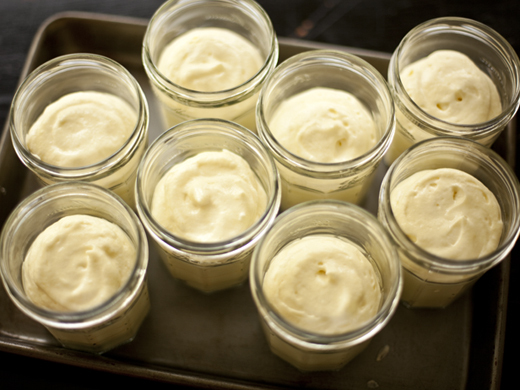 i love the jar, i love this lemon lime mousse..and i love your photo! Thanks for mentioning my little labor of love, Zoë! I’m watching you! You can come over any time! It is so worth a jar or two. 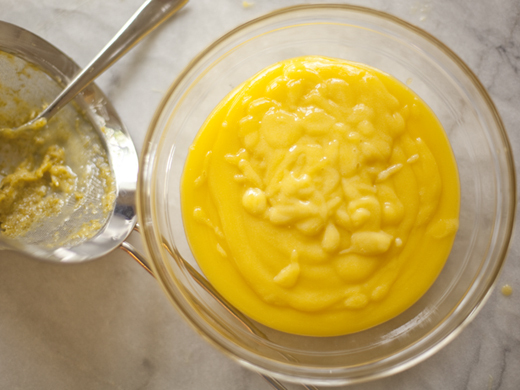 What other options can you give us, if we don’t want raw egg whites mixed in our mousse? Is it alright to take this out of the recipe? It sounds really delish, but just playing it safe. I’d like to make this for my mother-in-law as she loves lemon, and I don’t want anything to happen to her. 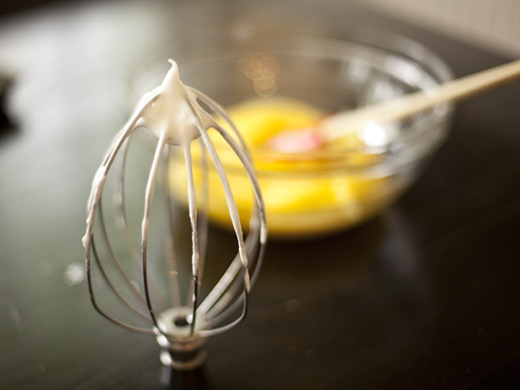 You can try pasteurized egg whites that are for sale in the grocery store. 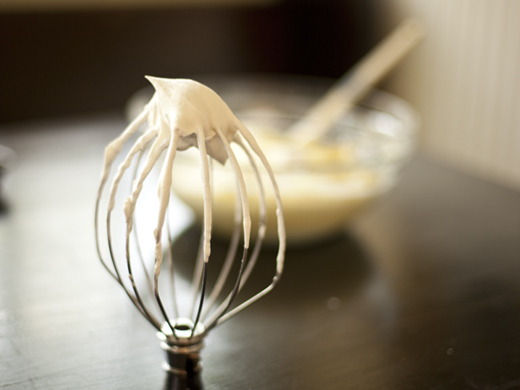 Or you can cook the whites with some sugar into a swiss meringue and then fold them into the mousse. I agree with the lemon/lime combination. I have no possible way of getting key limes here, not even bottled juice, and what works well is the mix of limes and lemons. Otherwise I just don´t bother. Do you think this works as a pie filling or is it too soft? Love it with strawberries! This combination is very light and fluffy. It would make a great filling, but won’t hold up very well, so you’ll need to use it right away. It may also be tough to cut, but it will taste great! I can’t see where it says how much zest of each lemon and lime one should include. Thank you for catching that omission. 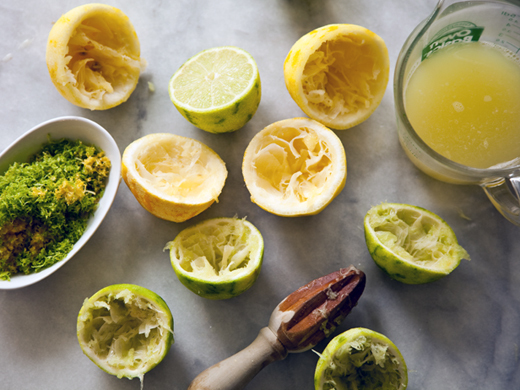 You are meant to use all the zest from the lemons and limes that you juice.